It’s that time of the year when flight tickets to Kolkata are costlier than a standard Thailand Holiday Package, with an Alcazar show thrown in for free. It is when people in Kolkata face huge traffic snarls, are pushed and shoved around in the sweat and grime, are forced to pay double the fare to the fleeing cabbie; but still have an innate excitement and happiness eerily similar to the inner peace of Kung Fu Panda’s Po. It is when Kolkata dressess up like a yesteryear Queen, who is coronated once a year, more as a mere ritual than due to an actual presence of power. Yes. It is Durga Pujo time. Durga Pujo is much more than a strict religious exercise. It is a celebration of life and community living, with friends and family, spreading across all communities and religions. It is a time for showcasing some of the brilliant artwork in the form of Durga Idols, Pandals and decorations, which light up every nook and corner of Kolkata. This is the time when Bengal claims a reverse brain drain with Bengalis from all over coming back to Kolkata, if only for a fortnight. While a majority of non-resident Bengalis are lucky enough to get back to Kolkata to be part of the bonhomie, professional obligations and unavailability of cheaper travel options, keep some of us back at our port of call. Gurgaon is a crazy city! Just like a “bere paka chele” (over smart kid), as we say in Bengali, it has grown up suddenly from being an obscure little village in the fringes of the National Capital, to a mega city where every global MNC has an India Office. A place where the swanky office buildings, glittering shopping malls and skyrocketing rentals make people compare it to the Dubais and Singapores of the world. This is a city where professionals from across the country come looking for those seven figure salaries and designations longer than an average Ekta Kapur serial title. In spite of often facing the pangs of suddenly turning from a little village to a supercity, with pub brawls, unpaved roads, lack of electricity and water, it still has that wow factor which makes it an aspirational one for people across the country. Bengalis have made their mark all across the world. So it is but natural that a huge Bengali workforce has found their calling in Gurgaon. Some of them, who have to stay back here during Durga Pujo, sulk for the entire time, missing the exuberance and frenzy of Kolkata. The perception that Gurgaon does not have any proper Durga Pujo celebration further reinforces this gloom, especially for the newly resident Bengali (or Kolkatan) of Gurgaon. The nearest one would get to experience Durga Pujo was northwards, at the Bengali bastion of CR Park, New Delhi. Last year when I was at Gurgaon during the Pujos, I got thinking! Gurgaon has a sizeable Bengali population, evident from the constant Bengali chatter one gets to hear at malls and restaurants. My mom once told me, if five Bengalis get together, there has to be an Adda…….and a Durga Pujo, as she had experienced in the 70’s in London. The online search resulted in nothing more significant than 'sponsored links' for flights to Kolkata and Pujo discounts and sales. So with the zeal and enthusiasm of finding the hidden Durga Pujos of Gurgaon, I set out in search of them. During the next few days, I found so many Pujos organized in Gurgaon, that frankly I started missing Kolkata a little less. Here’s a quick list of the best Pujos (in no particular order) in Gurgaon which might leave you quite surprised but will definitely make all my Bengali friends in Gurgaon happier than a rosogolla. This is the combined Pujo of Sushant Lok-1 (A & B) Blocks. Possibly the biggest Pujo in Gurgaon area-wise, it features beautiful idols of Ma Durga, her kids, her husband and Ashura, the Demon. The entire proceedings of the Pujo are managed by the sweet and adorable aunties of the society, who work day and night to prepare the Pujo offerings, flowers, fruits and all. Entry is free for all at this grand extravaganza. You get to have a sumptuous Bhog (Pujo meal) at the Pandal if you are lucky enough to be there at the right time in the afternoon. While the drawing competitions, skits etc keep the kids busy, the sanskritik onusthan (cultural programmes) with imported (?) Bengali singers (some of whom insist on singing Hindi songs) keep the adults engaged at the huge open air arena. On Navami night (possibly), the ladies enact a brilliantly choreographed dance-drama version of the Mahisasura Mardini (vanquishing of the demon by Ma Durga). Stalls serving lip smacking Kolkata biriyani, rolls and kebabs make the Bengali tummy happily call out for a Gelusil tablet. The shoot the balloon and jumping bag areas give the place a carnival mood. Overall a warm and welcoming Pujo which embraces every visitor and makes one go back with a part of it in his heart. This Pujo happens very close to my home which makes it my de-facto Parar Pujo. And like all Bengali boys, I feel my Parar Pujo is the best in the City. DLF is one of the oldest housing colonies of Gurgaon and has a sizable Bengali community. 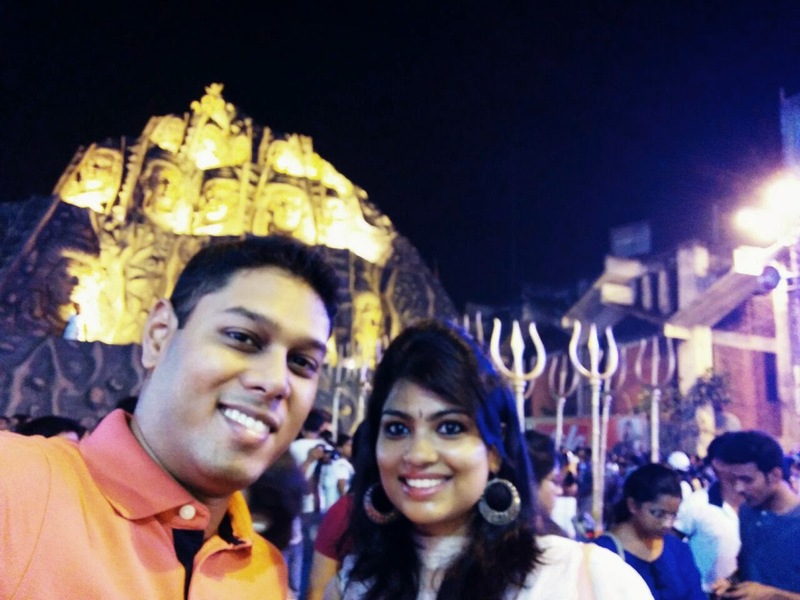 Their Pujo is one of the oldest too, happening since the last 20 years. This extravaganza was earlier well hidden in the lush green environs of DLF Phase-1. This Pujo had a very posh upmarket feel with primarily the DLF-I residents participating in the celebrations. The ek chala (single frame) Durga Idol used to be beautifully placed in the community hall stage. The place would always be choc a bloc with young and the young at heart alike. The hall was filled with chairs so one could sit back, relax, have an adda or just admire the beauty and power of Ma Durga. On one of the evenings, the young ladies of the Community would perform a euphoric Dhunuchi Naach mesmerizing the audience. The booming beats of the dhak, amplified by sound boxes, the well co-ordinated dance steps, the smoke and haze, gave one an unforgettable experience. The main meals probably used to be paid for and were served only to the members and their guests (I am not sure though whether it was free for all). The lawn next to the main complex had a huge variety of Bengali food. The now famous “Ki Hangla” chain of Gurgaon had a stall here selling some brilliant Radhaballavi Alur Dom, Fish Cutlet, Fish Finger, Dimer Devil, Misti Doi etc. The other stalls selling rolls, chowmien (the Kolkata roadside version), jhaal muri, phuchka, kosha mangsho took one back to Kolkata, at least gastronomically. The Pujo also had a separate space for musical and drama performances which is frequented by Bangla bands, Rabindra Sangeet singers and the like. The entry here was again restricted to members. The overall atmosphere of bonhomie and fun gave one a homely feeling. This Puja has currently shifted to Phase-3. All you get to see at the old venue in Phase-1 is a board proclaiming "Puja has shifted to Phase-3". Not very helpful but then again finding God was never easy! The earlier avtaar at Phase-1 used to be one of my favourite Pujos. I found it quite like the Pujo at Durga Bari in South Kolkata. Am sure the same atmosphere of revelry has been recreated at their new venue as well. Without doubt, a must visit. Another famous Pujo in Gurgaon, the big Pandal, in the middle of the field, gives it a very Kolkata feel. The Pandal is intricately designed and is quite high. The resplendent idol-a symbol of magnificence and power. Just like the other 2 Pujos, it has a big arena for cultural performances, from melodious instrumentals to rythmic dances. The food stalls tucked away beside the Pandal, accessible through a narrow entrance, offer some awesome Kolkata Biriyani along with Chicken Chaap and roti. Just like all other Pujos, options for Pet-Pujo (badly translated, worshipping the tummy) are immense. Again, a must visit. The oldest Durga Pujo of Gurgaon, being organized since more than 25 years, this one exudes an old world charm. Last year, the Pandal was decorated like a North Kolkata Zamindar’s House, painted in yellow and red, with ornate green windows. The atmosphere here is quite relaxed and takes one back to the by-lanes of North Kolkata. It is frequented by some extremely talented performers including rustic Baul singers and melodious orcestra bands. Again, F&B stalls in plenty are spread across the sides of the Pandal. The only advice is that the area gets a bit crowded and hence, should be preferably visited during afternoon. Unless of course, you want to get the Kolkata Pujo feeling, jostling through the crowds. What you see here is a nice community Durga Pujo with a beautiful idol, simple pandal and the usual food and performance areas. One of the visitor friendly features I remember was the thorough mosquito repellent fogging activity so that one can enjoy the evening revelry without getting bites all over. One of the few Pujos with a working and updated website with all details of the festivities (www.dgpc.in). Again, an affair put together by the Community residents for more than 10 years now. Just like its cousin, a simple and lovely extravaganza where the mild fragrance of Dhunuchi and incense sticks gives a familiar tug to one’s heart. Delicacies like mocha ghonto,begun bhaja,shukto, mooger along with specially flown in Gondhoraj lebu from Kolkata form part of the elaborate bhog served at the venue. Apparently, an Odissi dance recital is one of the main attractions this year. Just got an update from my friend, Sreyoshi Maitra, that this year there's gonna be some seriously good Bangla band performances by Anindya (Sahar), Shubhomita and Rupankar here. To keep one energised during the performances, with an unlimited supply of Kolkata street food, "Ki Hangla" has a stall here as well. So be there or be square. This is again one of the older Pujos of Gurgaon. Haven’t been there but from what I have heard, it is one of the best Pujos left of NH-8. Got to know about this Pujo from my friend Sreyoshi Maitra who has been happily Pandal hopping in Gurgaon and kindly giving my valuable updates on the locations and activities of this year. In her words ,"DLF Phase-V Pujo makes it debut this year and is amazing! I felt like I was in my very own New Alipore. It's classy, very clean, with good food, cultural dos and very well dressed folks." Haven't been there myself but it's sure to feature in my 'must visit' list next year. Sahastrabdi Durga Pujo Committee at Greenwood City. That was my list of Durga Pujo celebrations in Gurgaon. So get in those new clothes, wear the new shoes and step out for a Sharodiya Durgotshob experience in the millennium city. Be there, soak in the revelry and do let me know your favourite one. And yes, do visit CR Park once. Have a brilliant festive season ahead and happy exploring!! Sahashrabdi Durga Puja samity at Greenwood City. Very nice write up. U have very well narrated the sentiment of the 'probashi Bengalis' who cannot come home for Durga puja. People often write about pujas in Delhi but not about pujas in Gurgaon,which is still untapped. Must have been useful for those staying back though there may have been some changes in the location this year. Congrats for ur first post.